Statistics in mathematics is a collection, interpretation, analysis, presentation, or organization of data. This is a popular technique for how data is sorted and summarized. It is also defined as the state of facts how they can be given in the form of numbers, tables, or any other classified arrangement. Statistics is a branch of applied mathematics that is defined as numerical statements of facts in inquiry department placed together. It is also the study of the probability of occurrences of events based on qualitative data or collection of data. Statistics is generally used to inspect the heavy data collection in minimum budget only. Three popular types of statistical averages in mathematics are Mean, Median, Mode. Mean is the average where the sum of total values is divided by the total count of numbers. Median is the middle value when numbers are arranged in increasing order. If there are two middle values then the average of both values is the final output. Last is median where the most repeated value is the final answer. There is a list of basic statistics formulas whose values are related to statistical concepts or analyses. With the help of data collection, data analysis, and data summarization is easy. Data – this is a collection of facts, numbers, measurements, words, observations etc. Qualitative Data – this is a type of descriptive data. Quantitative Data – This is a type of numerical information. Discrete Data – This type of data has a specific value that is fixed and can be counted easily. Continuous Data – This type of information is not fixed but possible to measure. 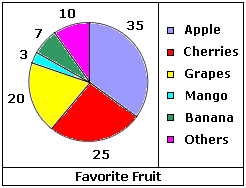 Here, is given a statistics problem with the solution to finding the favorite fruit of 100 people. The solution can be presented in the form of the pie chart. Bar Graph – Here, data is grouped and presented through rectangular bars where length is proportional to values and they can be presented either vertically or horizontally. Pie Chart – This is a special graph where the circle is used and divided into sectors that each of then signifies some value. Next is line chart, where a number of data points are connected through the straight line. Pictograph – As the name suggests, pictograph presents data in the form of images, it is more interesting and easy to understand as well. Histogram – This is a diagram made up of rectangles where the area is proportional to variable frequency and width is equal to class intervals. Frequency Distribution – This is a frequency table where data is arranged in ascending order of their magnitude. Do learning statistics for students is necessary? If you will see around then applications are just enormous like military, economics, population etc. This technique is also used for mathematical analysis like linear algebra, differential equation, or probability theory etc. Statistics are good for different sectors too like geology, psychology, weather forecasting, probability and many others. You just have to understand the data in deep or it can be named as Mathematical Science too.